If your Italy itinerary includes driving in Italy, and if you have decided not to listen to our advice to use a private car with driver, you’ll need to familiarize yourself with some key Italian road signs. Just like the language and the food, road signs in Italy will be foreign to you, but this is not the kind of thing you want to figure out on the fly. 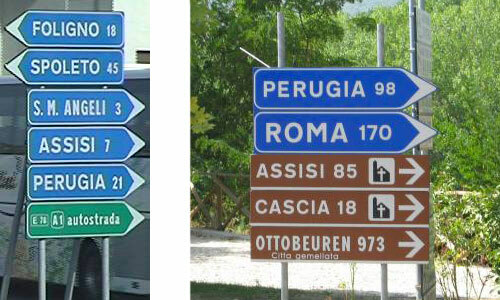 Do a bit of research so you understand Italian road signs before you leave, and you’ll discover that they do actually make sense. 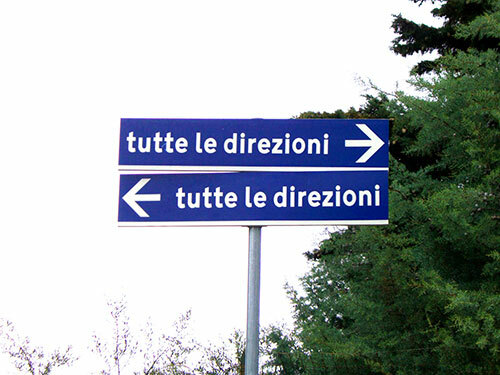 For example, the sign below, "tutte le direzioni" (translated as “all directions”) actually means turn right and turn left to access all major roads! Most likely there will be another intersection with more signs, so drivers can branch out from there. When you get to Italy, you’ll see many more signs on the road than you do at home in North America. Often, you’ll be behind the wheel, stopped at an intersection, and you’ll need to make a quick decision so you need a strategy to focus your attention quickly. In Italy there are of course speed limit signs and no entry signs, but there are also signs for hotels, restaurants and attractions. There are frequently multiple signs for the same destination, color-coded based on the type of road that gets you there. So you might see a blue sign and a green sign with the same destination printed on them. Your strategy should be to always know what color road sign you’re looking for. You’ll inevitably arrive at an intersection posted with many signs, like in the photo above, and have a second or so to decide which way to turn. If you know you’re only looking for a green sign, you’ll see it much more quickly. Blue signs indicate main roads that are not highways. If you don’t want to take the highway to your destination but don’t want to be driving on dirt roads either, follow the blue roads. They are often more scenic and sometimes faster than the green roads. And they’re free. 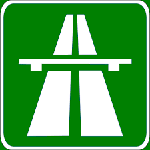 Green signs indicate the highways, which is a toll road. Note: the highway may not actually be very close to the sign, but if you continue to follow the green signs, you will eventually hit it. If you’re going to be driving on the autostrada, remember that you'll have to pay for it. Brown, yellow, and white signs are also used, though the color-to-function rules are not completely reliable. Restaurants are yellow or white. Churches, places of architectural interest, scenic drives, and tourist destinations (sometimes the tourist office) are usually brown. Everything else is white. Again, note: I have followed signs for restaurants into the hills for many, many miles before actually arriving. The sign does not necessarily mean that the restaurant or attraction is nearby. 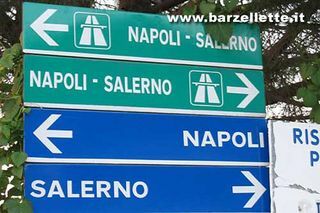 So, apply your new knowledge: even though the Napoli/Salerno photo below is from a website that translates as “jokes” (even Italians poke fun at their road signs), it has not been photoshopped. It makes more sense now, doesn’t it? I picked these six because I think they are important, and are also not easy to figure out if you’ve never seen them before. This sign looks like a yellow diamond surrounded with a white border and a black outline, and means you are on a road with the right of way. Cars turning in from the left or right must yield to you. When you see the black line through the same sign, you no longer have the right of way and you must yield to other traffic coming in from the right or left. These signs are circular, with a blue center and a red outline, with a red bar or two crossing the circle. The first sign means no stopping, and the second one means no parking/tow zone (so really, no stopping either). Follow the bullseye sign if you’re looking for the center of the city. Very useful when driving to a city with more than one exit off the autostrada, and also helps locate the historic center within the city limits. The first sign just means no entry with a car. Often there are times of day posted underneath, which means no entry just during those times. Many Italian cities have Limited Traffic Zone (or ZTL in Italian) which are areas in the historic centers in which you cannot drive, and if you do, you’ll be mailed a ticket, via your car rental agency of course. However there are many variations of this sign that describe things you are not allowed to do: I’ve included no passing, no bicycles, and wrong way, but there are many more. The top sign, a white circle with one black bar, means “it’s okay to drive on this road now”. The second sign, with a car on each side of the black bar, means “end of no passing zone”. If you already (drive on the right side of the road and) know how to navigate a roundabout or traffic circle, then no worries: Italian roundabouts are the same. But if you are not familiar with them, learn entry and exit rules before you accidentally have to navigate multiple lanes of traffic, all driving in a circle, on the fly. 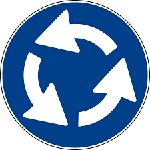 Traffic circles in Italy are very common.